The Partition of Africa began with the Berlin Conference of 1884-1885, and was the cause of most of Africa’s borders today. All the major European States were invited to the conference. Germany, France, Great Britain, Netherlands, Belgium, Portugal, and Spain were considered to have a future role in the imperial partition of Africa. The Partition of Africa, also known as the Scramble for Africa , was a process of invasion,, colonization and annexation of African territory by European powers. 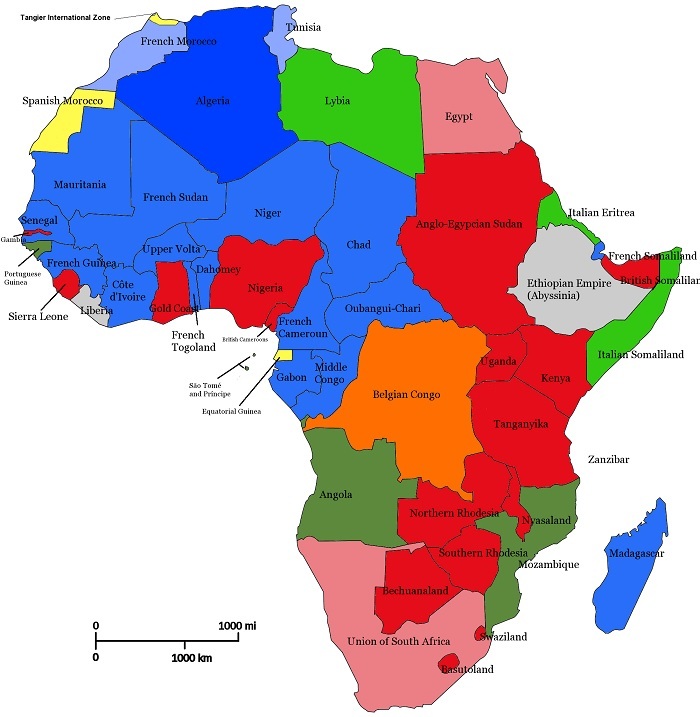 The political map of Africa (below) that shows its independent countries had not been drawn by United Nations, African Union or by African nations. It is the result of the European Colonial Occupation that invaded African Continent at the end of the 19th century and divided it up into territories with colonial borders for their own political sphere of influence. When leaving Africa, mainly in the 1960s, the Europeans based the independence and diplomatic recognition of all African emerging countries including Somaliland on their colonial borders inherited from colonial powers.  a capacity to enter into relations with the other states. Somaliland has perfectly fulfilled the four required conditions to be recognized as independent country and that is why it was recognized on June 26, 1960 by the United Nations and many countries of the international community. The borders of Somalia, Somaliland, Djibouti or any other Africa country have the same international status and legitimacy because they all had been drawn by European Colonial powers. Anyone who opposes the legitimacy of Somaliland borders, its statehood, its independence and its diplomatic recognition is challenging the borders and sovereignty of all African independent states (54 states) whose borders also rose from or originated in their colonial borders. 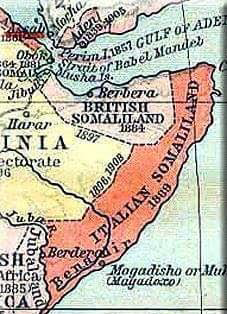 Federal Somalia recognizes the border between Somaliland and Djibouti drawn by France and Great Britain but does not recognize the border between Somaliland and Somalia drawn by Great Britain and Italy. What a laughable historical ignorance! Similarly, borders of the Arab World, Asia and South America had also been drawn by Colonial Powers, mainly by Great Britain, France and Spain.  Fulani Clan: This clan inhabits in Mali, Nigeria, Niger, Chad, Cameroon etc.  Tuareg Clan: This clan has inhabitance in Senegal, Nigeria, Mali, Niger etc.  Lunda Clan: This clan inhabits in Congo, Zambia and Angola.  Yoruba Clan: This clan has inhabitance in Nigeria, Benin and Togo.  Maasai Clan: This clan inhabits in Kenya and Tanzania.  Oromo Clan: This clan inhabits in Ethiopia, Kenya and Sudan.  Swazi: This clan inhabits in Swaziland, South Africa and Mozambique.  Lemba Clan: This clan has inhabitance in Zimbabwe, South Africa, Malawi and Mozambique.  Hutu Clan: This clan inhabits in Rwanda, Burundi and Congo.  Tutsi Clan: This clan inhabits in Rwanda, Burundi, Congo and Uganda.  Afar Clan: This clan inhabits in Ethiopia, Eritrea and Djibouti.  Berber Clan: This clan has inhabitance in Morocco, Tunisia, Libya and Algeria. The land and the people of Harti subdivision (Dhulbahante and Warsangeli) are integral and inseparable part of independent Somaliland for historically inhabiting within the borders of Somaliland British Protectorate. Thus, there is no “disputed land or territories” in Somaliland as some may claim irrationally. Somaliland does not accept the idea of “disputed land in Somaliland” as any other African country would not accept to call part of its territory “disputed land”. country, then the territorial integrity of each African country would be questionable and would be at risk of dispute and continental disintegration through endless devastating clan wars. The internal security, stability, and peace of Africa rest on respecting, recognizing and implementing its current borders that rose from colonial borders. If an African country would claim the tribe or clan and its land located in another African country, the continent would fall to endless devastating, bloody clan wars, violence and anarchy. The African continent would not exist as we know it today. The peace and stability of African states depend on respecting and recognizing colonial borders. United Nations and African Union should not allow any country like Somalia or any other country to redraw African colonial borders to avoid the danger of plunging the continent into endless clan wars and anarchy. African Union and African leaders claim that if Somaliland is recognized, it would shift or change the borders of current African independent states inherited from colonial powers leading to instability and political unrest in Africa. If that claim were true, why did not the recognition of South Sudan and Eritrea change the borders of Africa and cause instability and political unrest in African continent? Senegal and Gambia founded federation or union in February 1982 calling it Senegambia. That union was dissolved in September 1989 after disagreement and each country regained its original independence and diplomatic recognition without changing the borders of Africa. So, why not Somaliland retaining its independence and diplomatic recognition achieved separately on June 26, 1960 after withdrawing from the union with Somalia? It is deafening that UK, which colonized Somaliland British Protectorate, is still reluctant to recognize Somaliland knowing that Somaliland achieved independence from Great Britain on June 26, 1960. United Kingdom recognizes its former colonies in Africa such as Egypt, Sudan, Zambia, Zimbabwe, Kenya etc. but does not recognize Somaliland for unknown reasons. Is not that double standard for United Kingdom? Somaliland diplomatic recognition does not need any approval from Somalia as any other African country did not need approval of its independence and diplomatic recognition from any other African country. When UK granted independence to Zimbabwe in 1980, Zimbabwe did not need approval from Zambia for its independence and diplomatic recognition. Somaliland is not a secessionist or breakaway region from Somalia but Somaliland just withdrew from the union with Somalia after Somalia grossly violated the union and committed injustices and atrocities in Somaliland between the years 1960-1991. If Nyanza Province of Kenya or Arusha Region of Tanzania or Puntland province of Somalia secede or break away from their own respective countries, they would definitely qualify to be secessionists, separatists or breakaways and that would change or shift the colonial borders of Africa inherited from colonial powers and that would create instability and political unrest in the continent of Africa because these provinces share history, colonial borders and independence with their own respective countries. The Arab World, which has nearly 17 independent countries such as Algeria, Bahrain, Egypt, Iraq, Jordan, Kuwait, Lebanon, Libya, Morocco, Oman, Qatar, Saudi Arabia, Syria, Tunisia, United Arab Emirates, Yemen, and Sudan share same language, religion, culture, and color but have separate independent states. They have different independent states, flags, governments and borders. These countries do not share federal systems or unions for fear of injustices and disagreements. Only justice and fair power-sharing are the most important factors for a union to survive and that is what Somalia failed to understand in the years of the union. The declaration of Organization of African Unity (O.A.U) in 1964 on African Borders was the formal acceptance of the existing colonial borders inherited from colonial powers on which independence and recognition of each African country were based including Somaliland. That declaration had nothing to do with unifications, federations, and unions between two or more African countries like the failed union between Somaliland and Somalia formed unthoughtfully and hastily in 1960. A union or federation could be dissolved anytime if the sides disagree each restoring and retaining its original independence, diplomatic recognition and borders. That declaration reinforces the rightful claim of Somaliland to be recognized as independent nation based on its colonial borders. That declaration does not prevent Somaliland from withdrawing from the union with Somalia and restoring its independence and diplomatic recognition. achieved on June 26, 1960. If Uganda and Kenya share union today and after some time they disagree and dissolve that union, each would still retain its independence and diplomatic recognition as a nation on its own colonial borders. United Arab Republic (U.A.R. ), a political union of Egypt and Syria proclaimed on Feb. 1, 1958, and ratified in nationwide referendum ended on Sept. 28, 1961. Syria seceded from the union after the 1961 Syrian coup d’état. After dissolving the union, each country retained its original independence and recognition status. Somaliland Declaration on the Origin of African Borders declares that Somaliland borders have the same international legitimacy and legality with the borders of all independent African Countries that originated in the colonial borders drawn by European Colonial Powers and, for that reason, Somaliland deserves diplomatic recognition of the international community based on its former British Protectorate colonial borders. Puntland’s tribal armed militias along with reinforcements from Federal Somalia are entrenched now within 50 miles inside Somaliland territory. Ceasefire may not hold at all as long as these hostile forces are stationed inside Somaliland. Peace will come only when Puntland Administration withdraws its armed militia from Somaliland territory. The UN, EU and OAU know well where the border (the Colonial border) between Somalia and Somaliland runs (5 miles West of Growe). They must pressure Federal Somalia and its Puntland Administration to withdraw from Somaliland territory before another unnecessary bloodshed in order to have peace in the region as no country accepts to have enemy forces on its soil. If the United Nations fails to convince Puntland Administration of Federal Somalia to withdraw its armed militias from Somaliland territory, then Somaliland has the right to liberate its territory from Somalia to defend its territorial integrity and sovereignty.